The way points on this map are taken from my GPS Spot tracker. You can make the map bigger or alter its appearance by clicking on the controls. 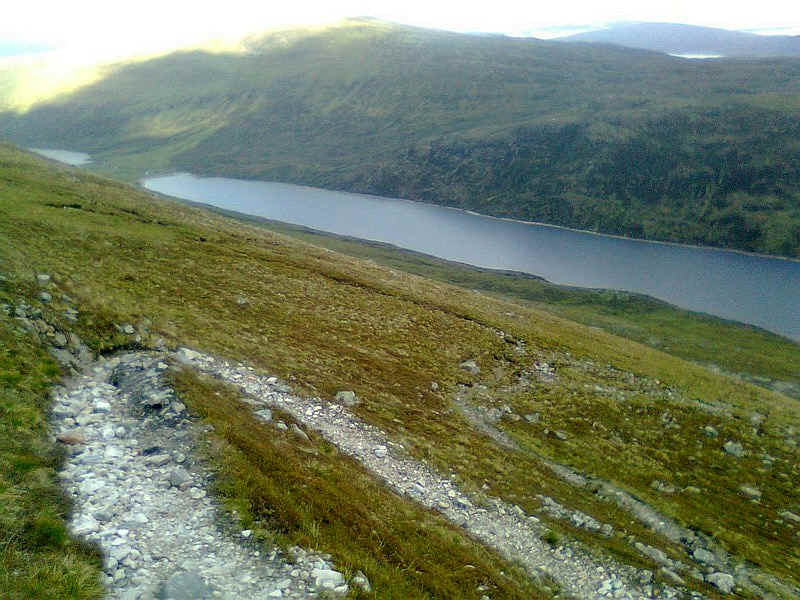 In June 2011 I was staying in Fort William and took a morning bus to Kinlochleven. 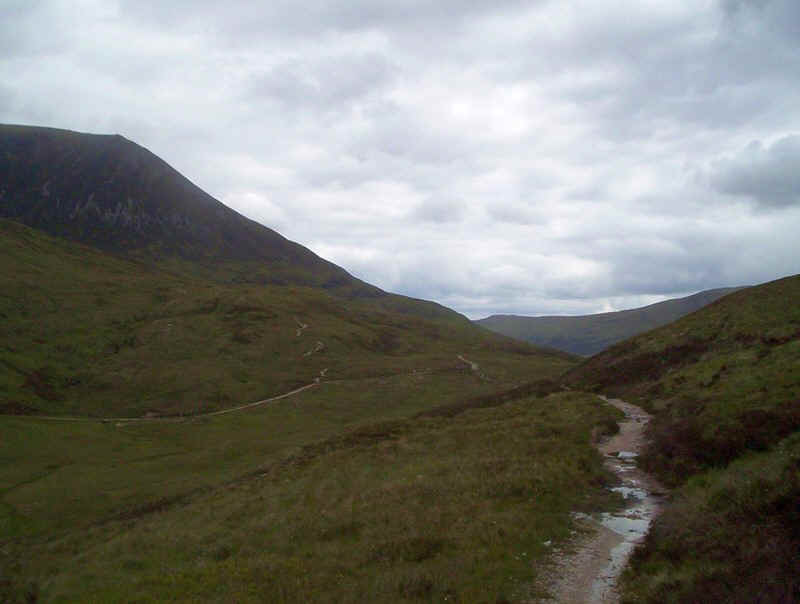 As it was a school day the morning services to Kinlochleven are dictated by school services so I didn't start the walk until 10.45, much later than I'd really have liked. 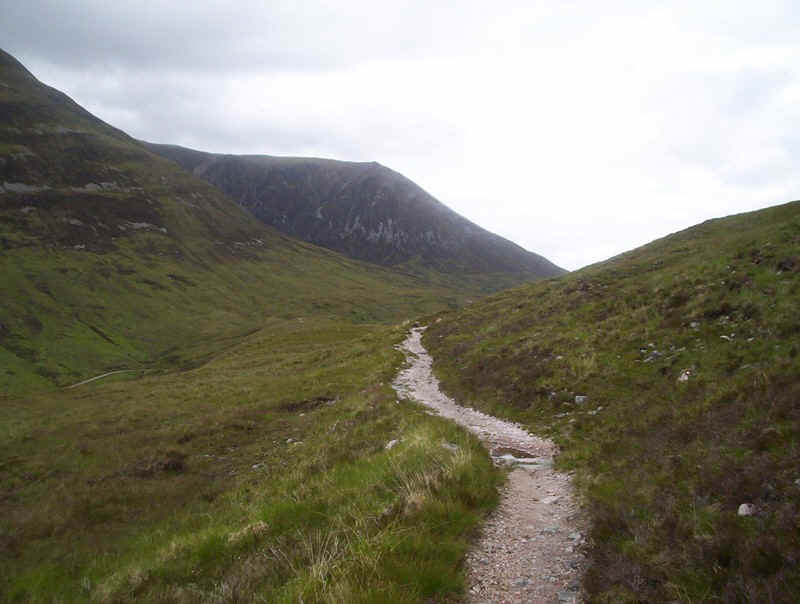 Saturdays and school holidays have a much more walker friendly service in the morning. 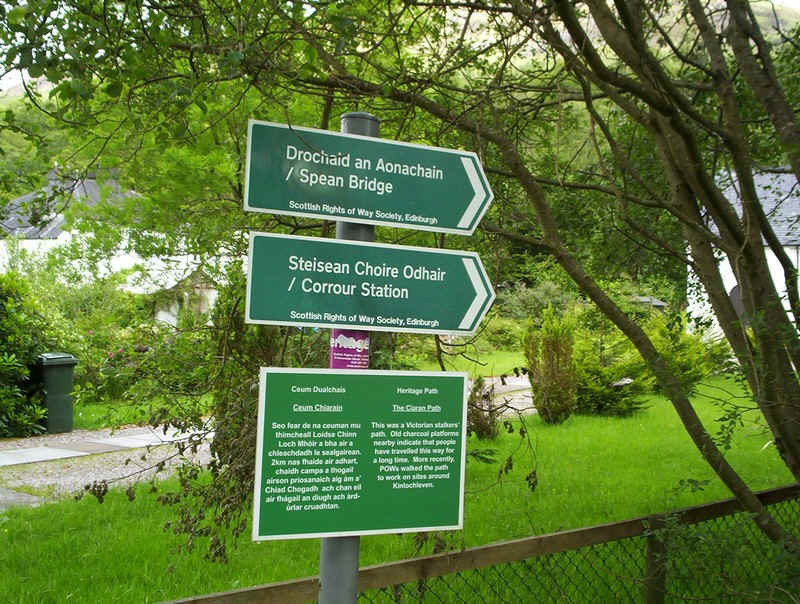 The walk starts near a small church on a path signposted Grey Mares Waterfall and also these Scottish Rights of Way Society signs. 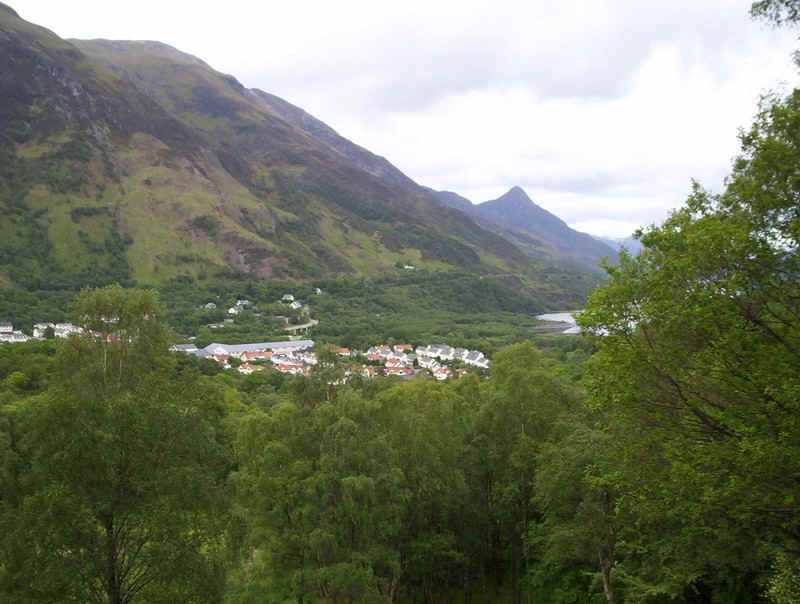 .....this view of Kinlochleven appears. 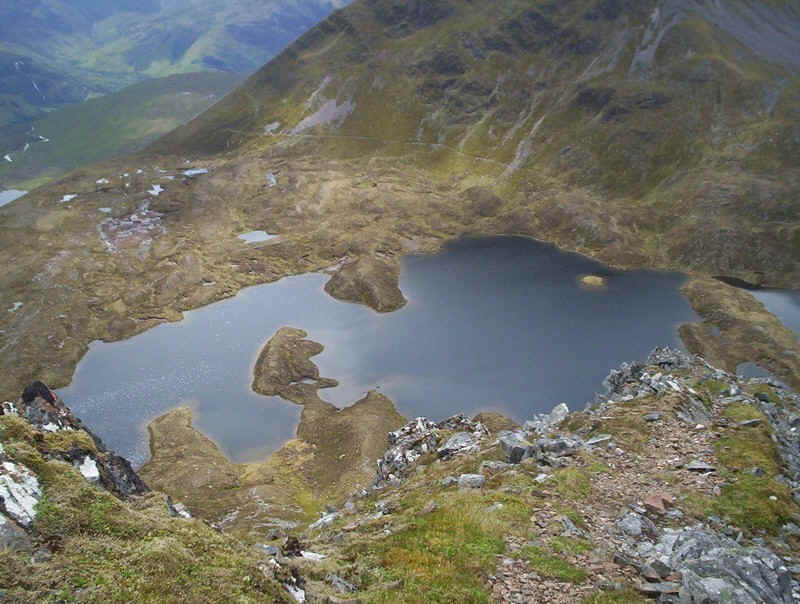 A view back shows the Corbett Mam na Gualainn and Loch Leven. 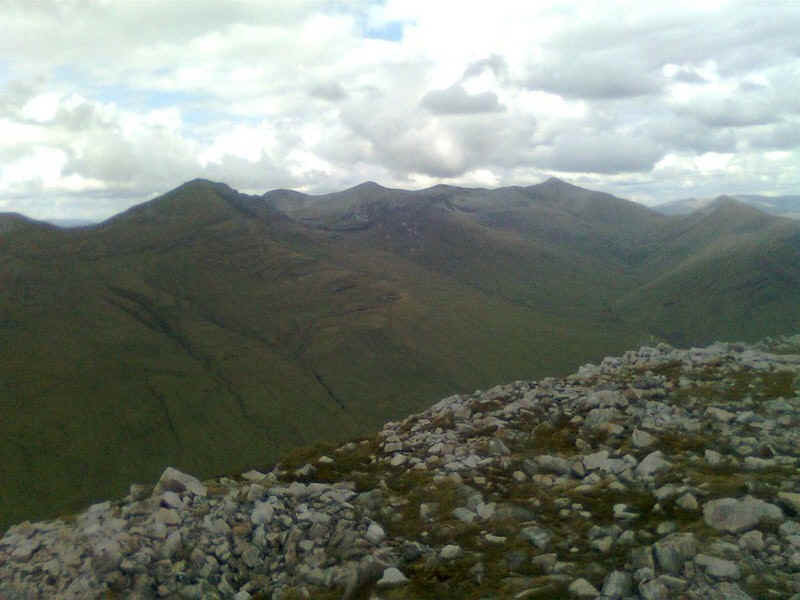 To the north is this panorama of the Mamores; Sgurr Fhuarain, Am Bodach and Na Gruagaichean. 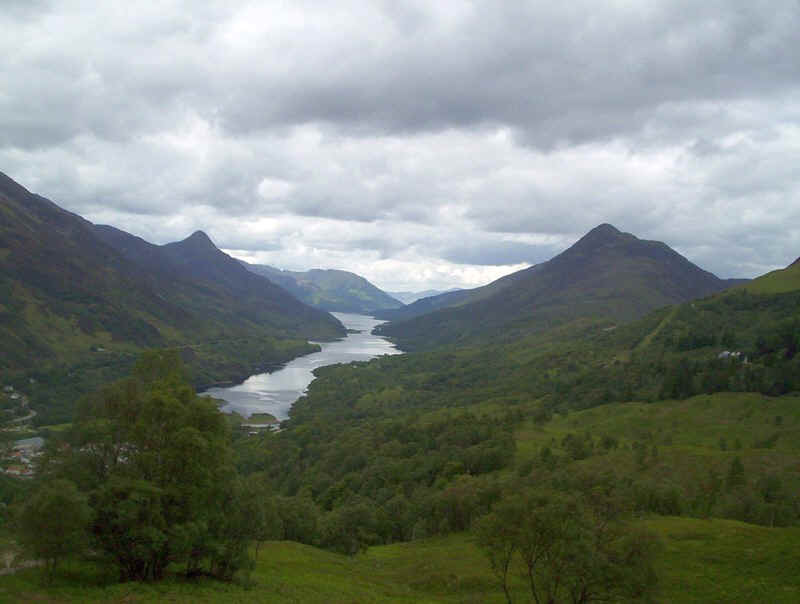 A marvellous clear view back along Loch Leven shows the pointed Pap of Glencoe to the left and Mam na Gualainn on the right. 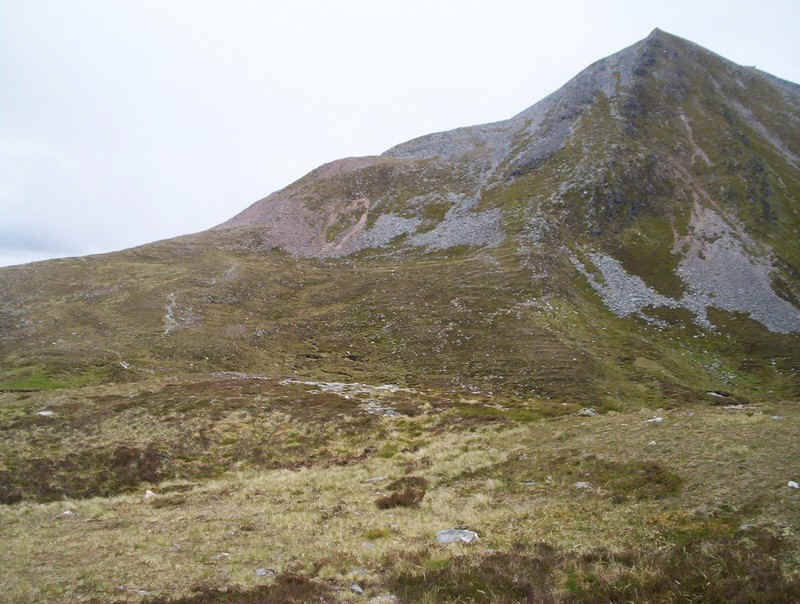 ......with the land rover track from Mamore Lodge visible on the left and the beginnings of the path up into the hills above it. 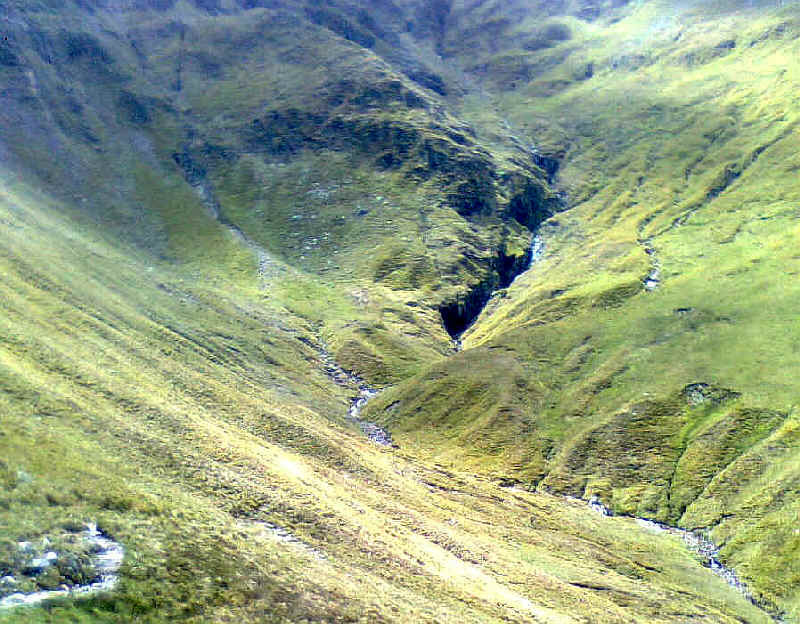 The slopes of Sgor Eilde Beag tower above the valley. 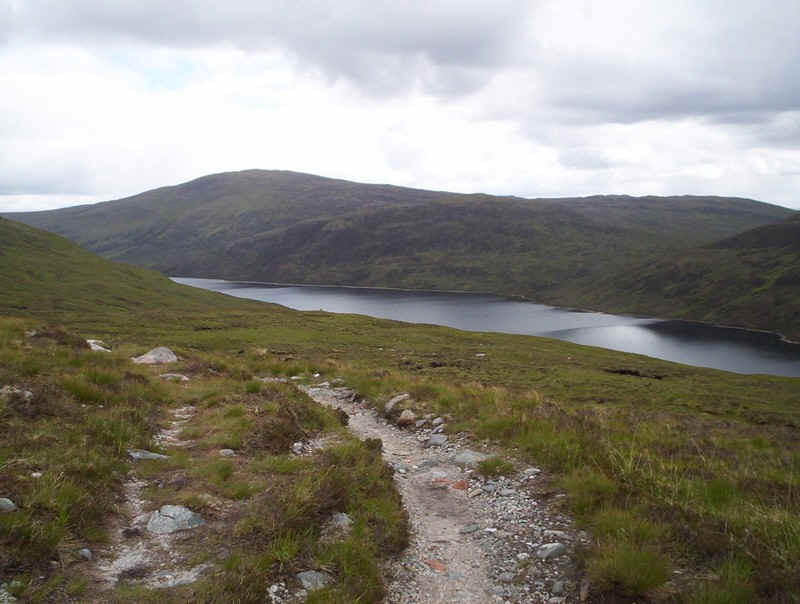 ...which climbs steadily above Loch Eilde Mor. .......cross two streams. 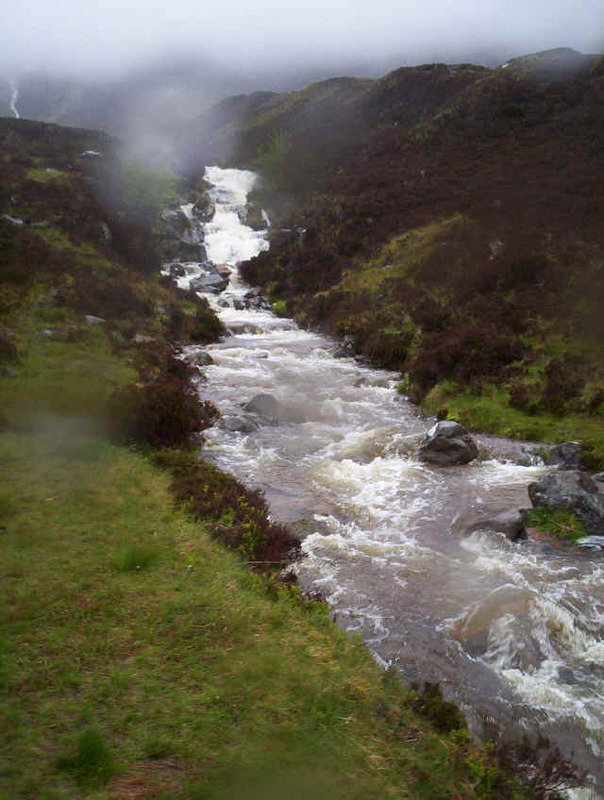 The last time I tried to climb these hills in 2005 we decided not to cross this stream as it was a raging torrent after days of heavy rain. 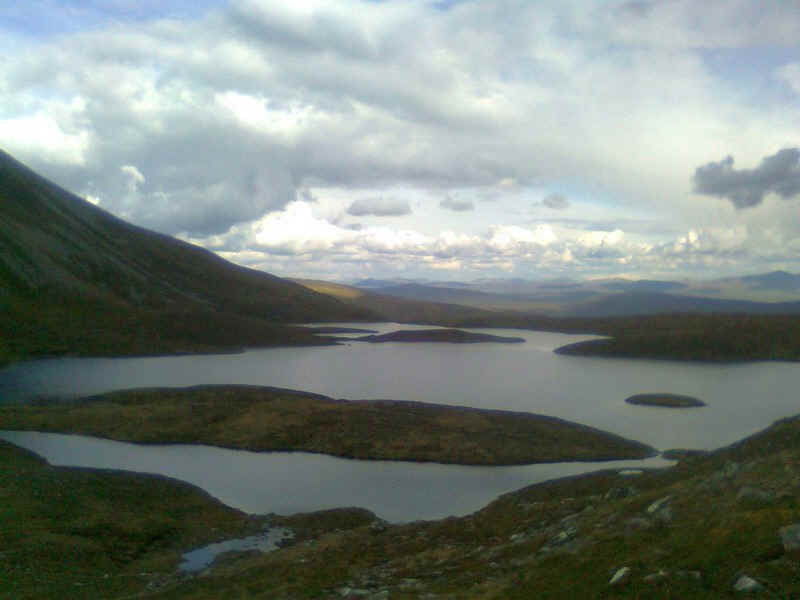 ....and across to the Blackwater reservoir. 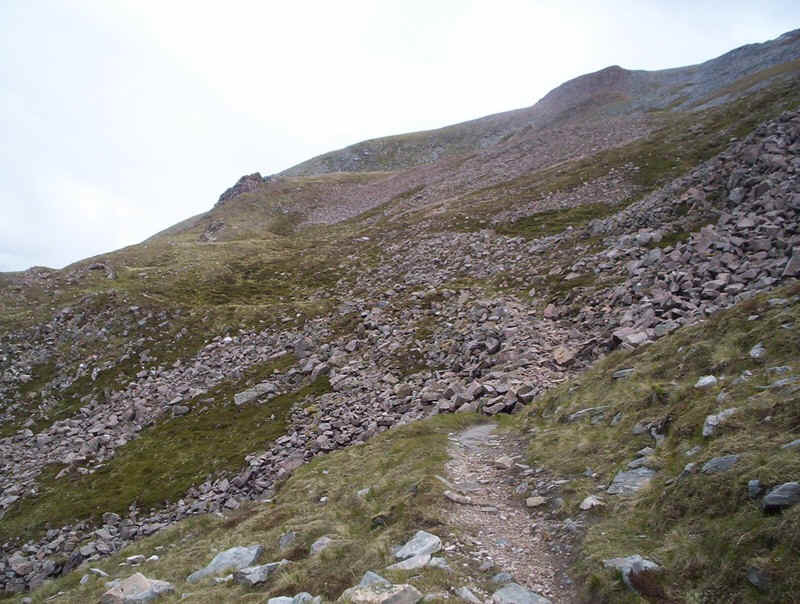 ...to reach Coire an Lochain. 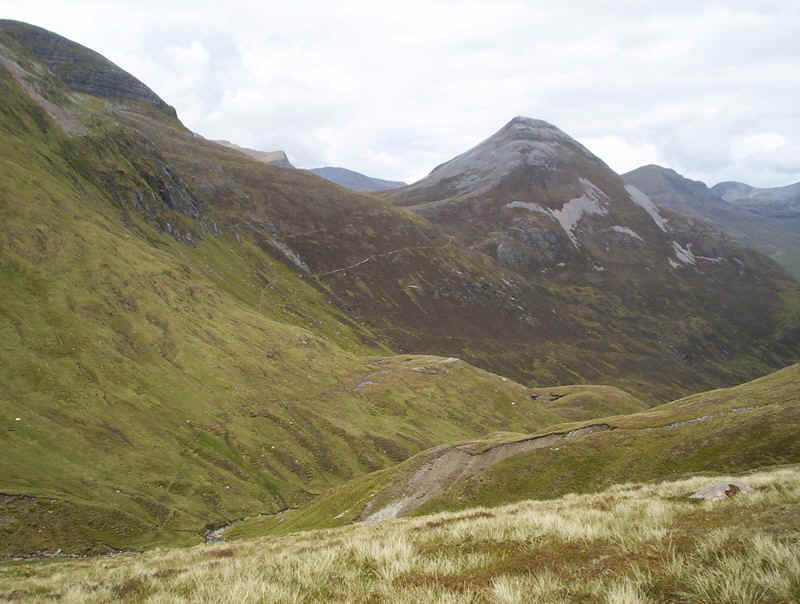 A panorama of Coire and Lochain with three of the Mamores Munros in view; Binnein Mor on the left, the pointed Binnein Beag in the middle and Sgurr Eilde Mor, my first target, on the right. 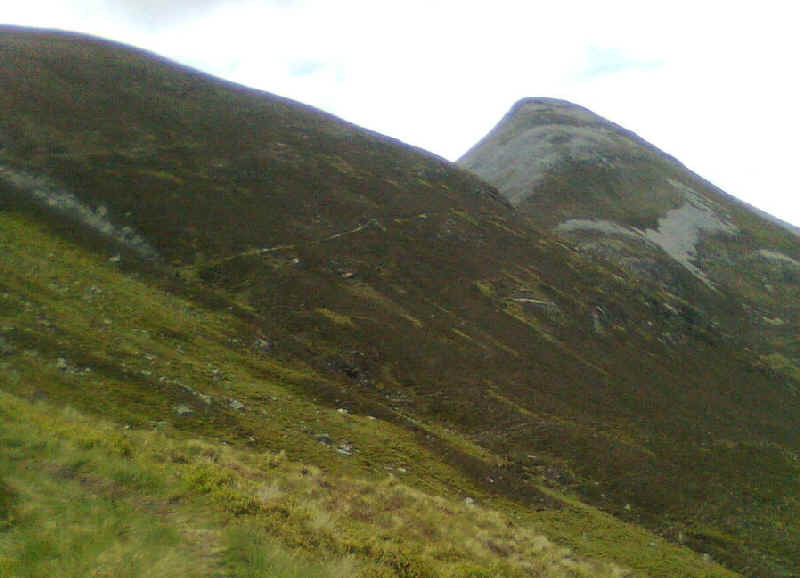 .....which heads across grass towards the hill. 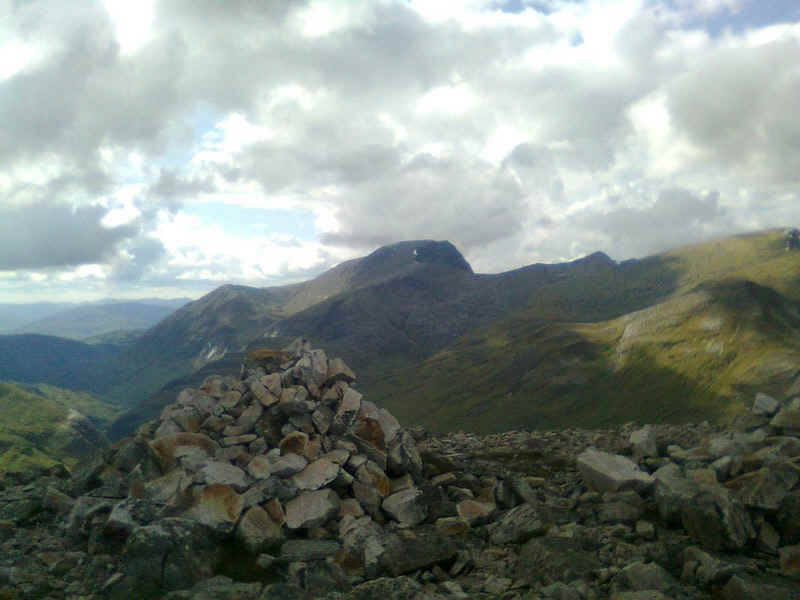 Looking backwards towards Coire and Lochain with the Glencoe mountains in the background. 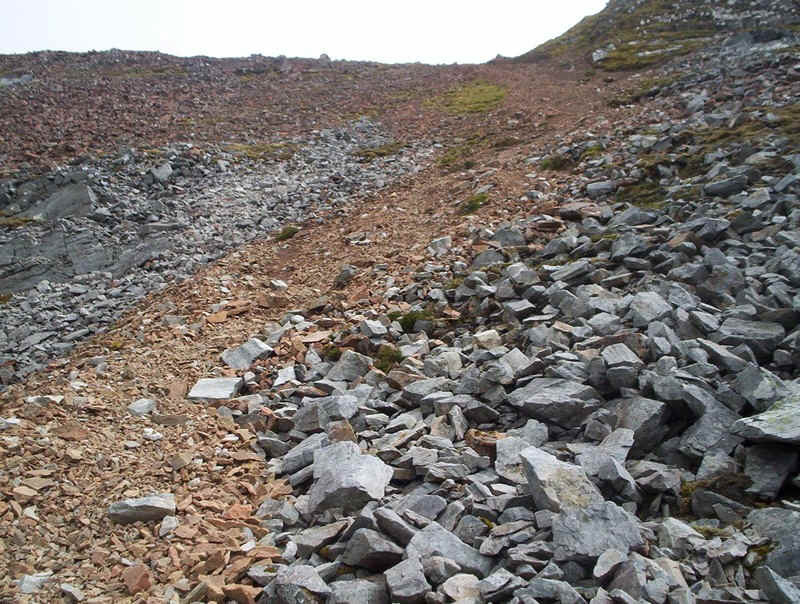 The path to the summit is rough and crosses sections of differing types of scree. 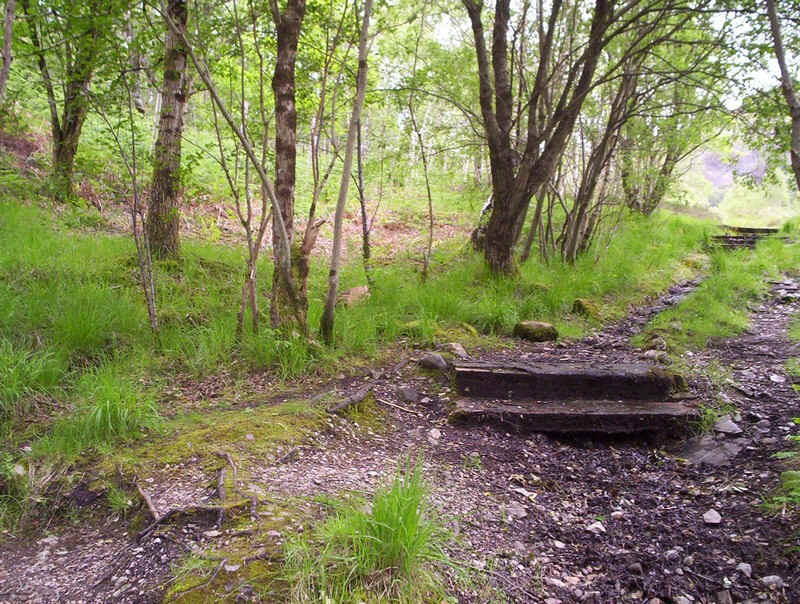 In places the slop is relatively gentle. 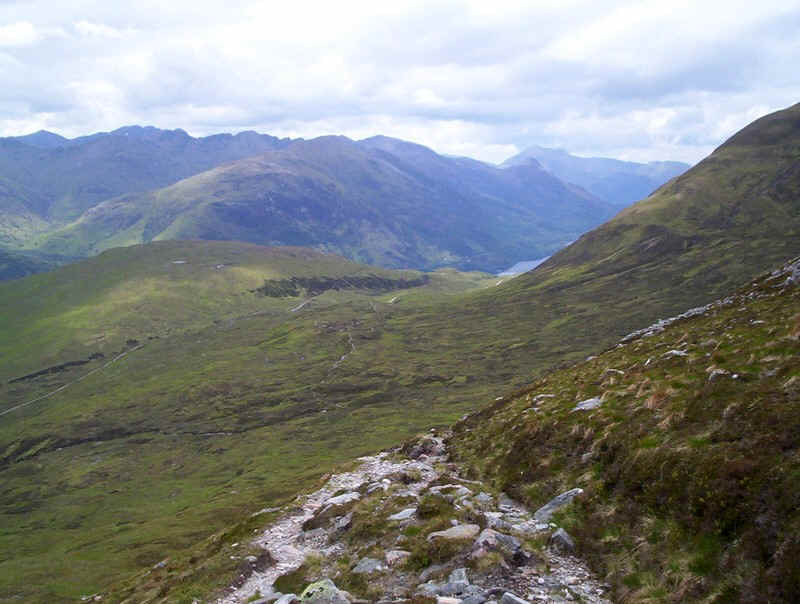 On the way up there is time to pause for breath and take in the view. 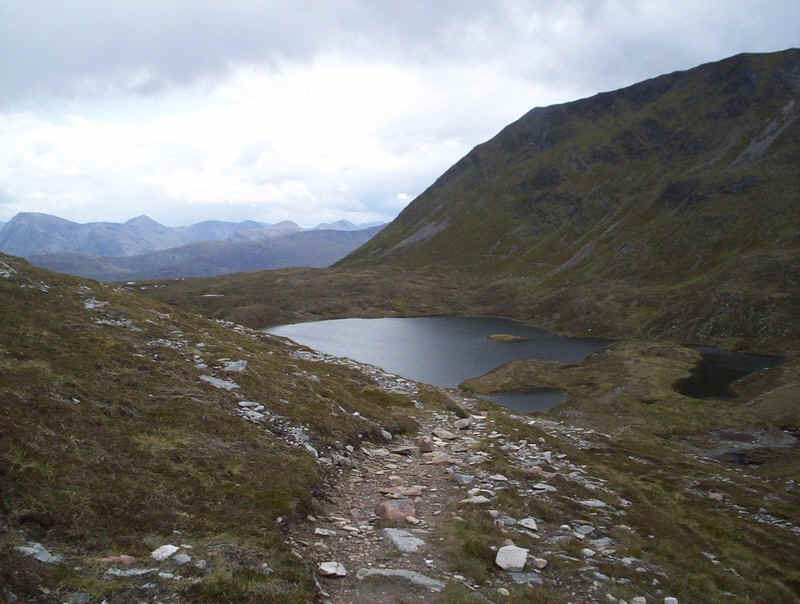 Her is Ben Nevis, Carn Dearg and the Aonachs appearing beyond the lochan at the foot of Binnein Beag. 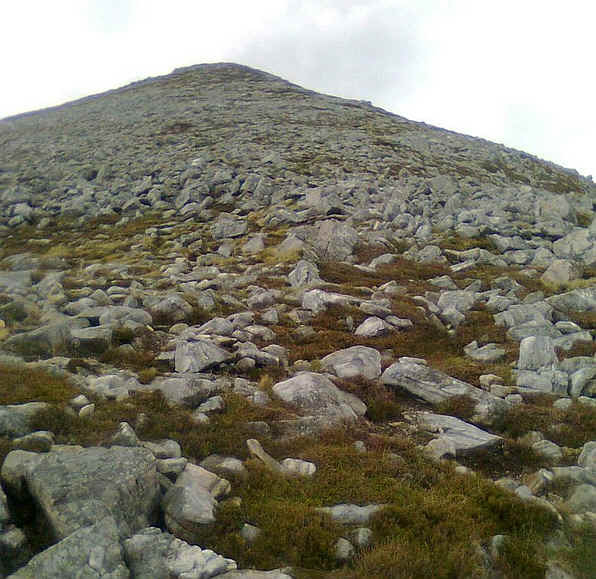 ....towards the top extremely difficult to keep upright upon. 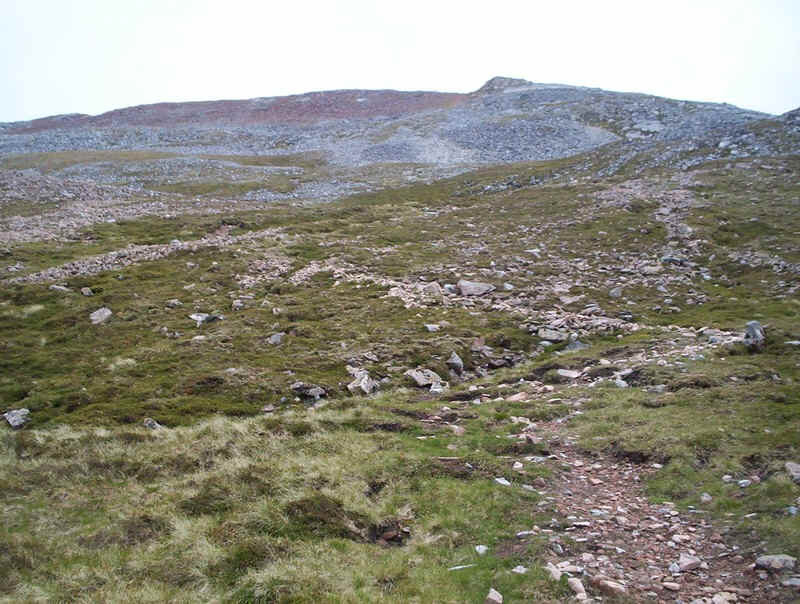 Just before the crest of the scree slope there is a clear, almost level track that leads to this sheer drop down into the corrie. 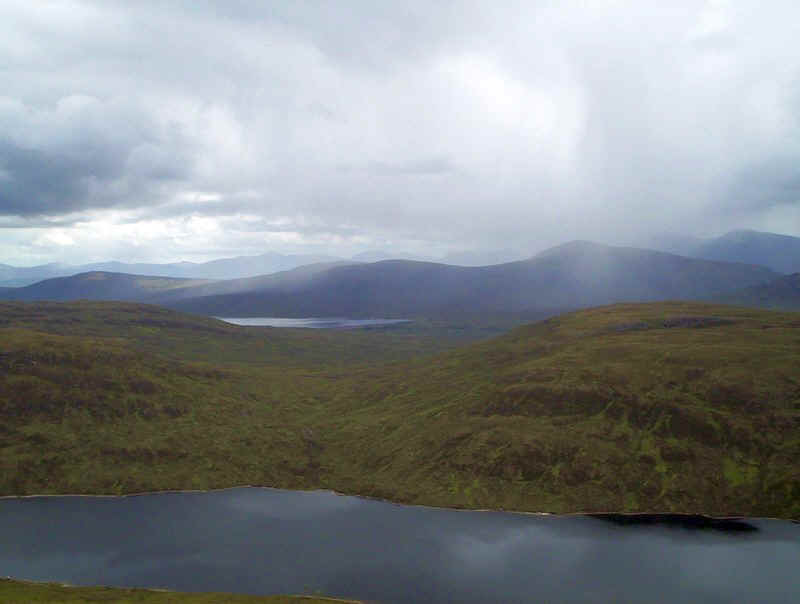 It gives a "helicopter" view of the lochain but I wouldn't like to be there in misty or windy weather! 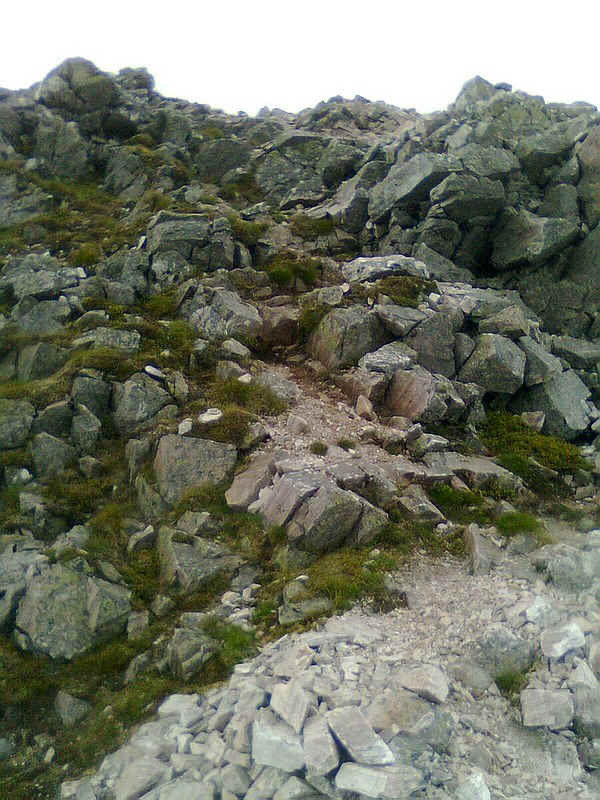 The scree path suddenly ends and there's a track over the stones towards the summit up the narrow ridge. 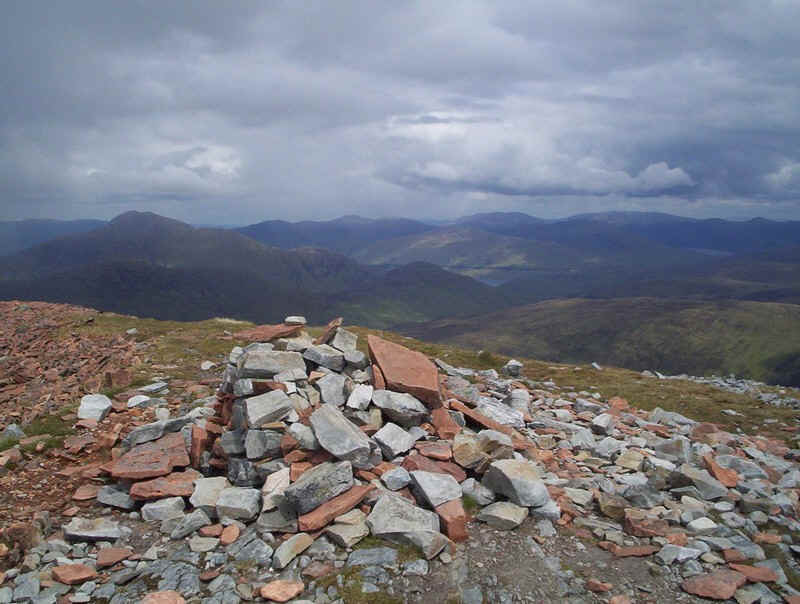 The summit cairn of Sgurr Eilde Mor. 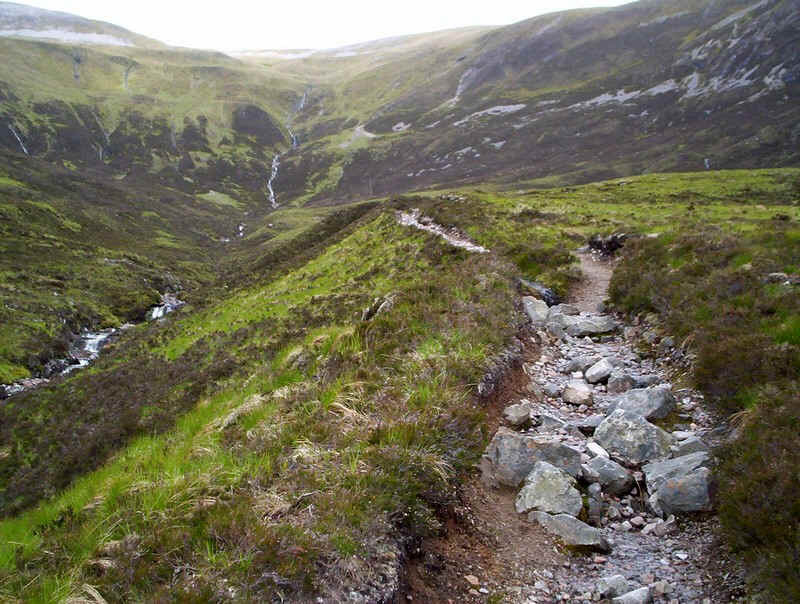 Given the difficult terrain on the climb I was pleased with the time from Kinlochleven of three and a half hours, just a quarter of an hour longer than in the SMC guide. 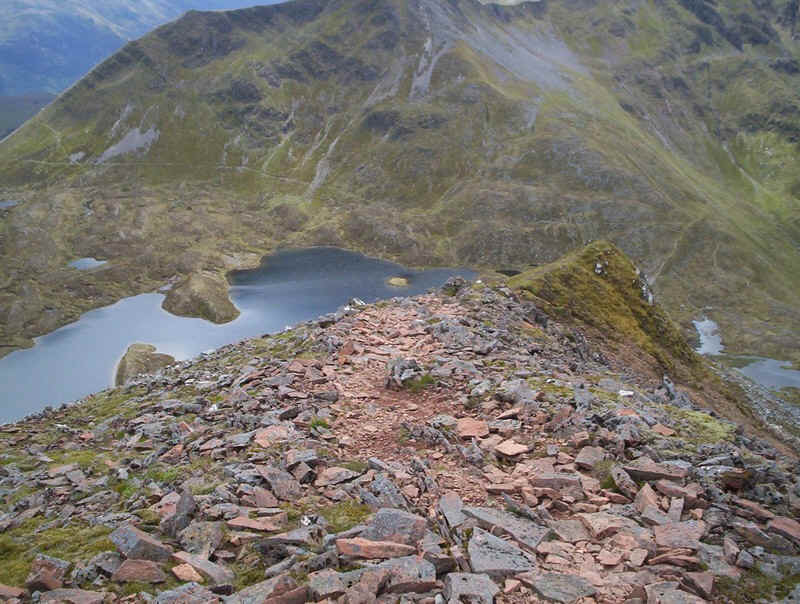 This is a complete 360 degree panorama from the summit. 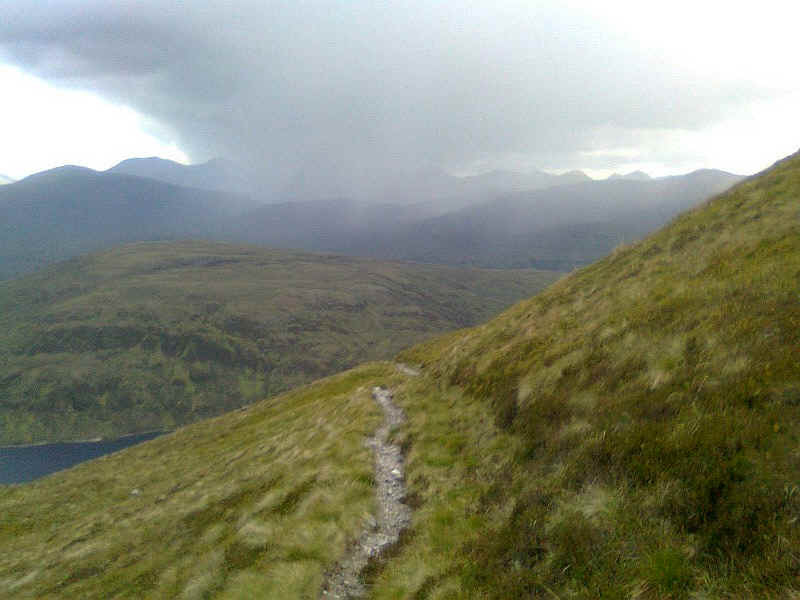 From left to right: Stob Coire Easain, Loch Trieg, the Blackwater reservoir, the Glencoe hills, Binnein Beag, Ben Nevis and the Aonachs and, under the rain shower, the Grey Corries. 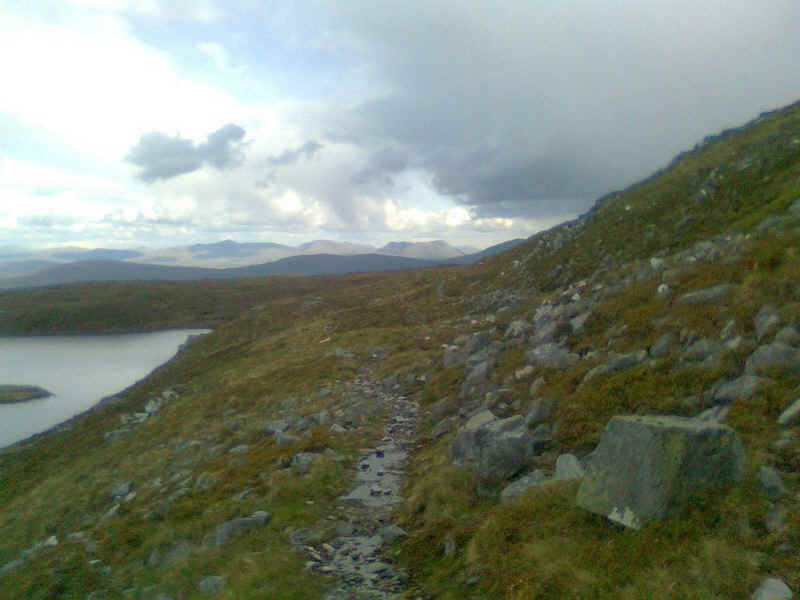 The next hill I wanted to climb was Binnein Beag, the small pointed one in the right foreground. 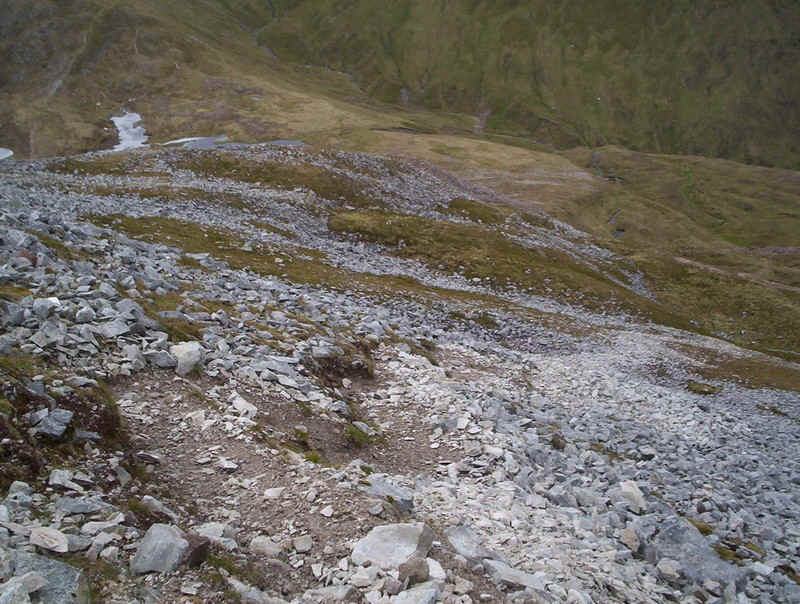 Returning down the ridge I was delighted to see that my dislike of big drops seems to have been tamed. It certainly looks and feels rather exposed but I felt perfectly comfortable. Mind you there was little wind and it wasn't raining! 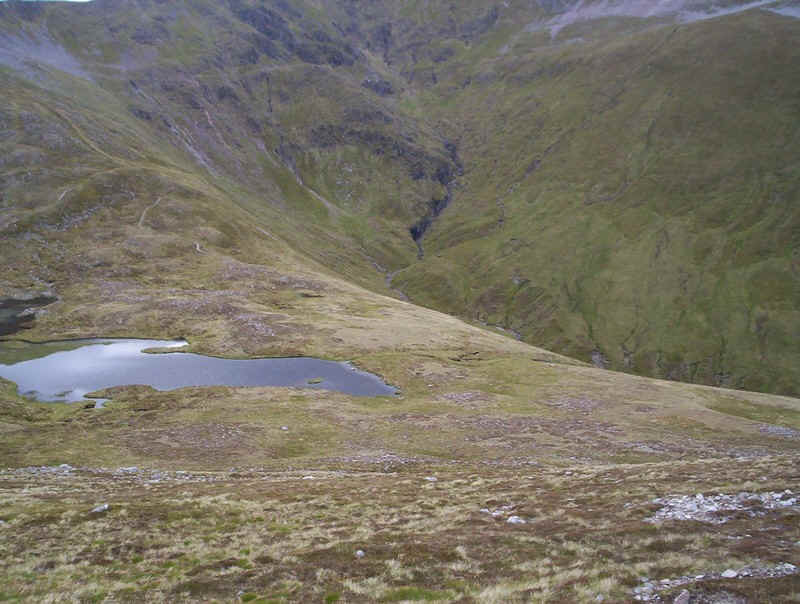 I took it very carefully down to the lochan, although it wasn't as difficult as I'd expected as the worst of the scree can be avoided. 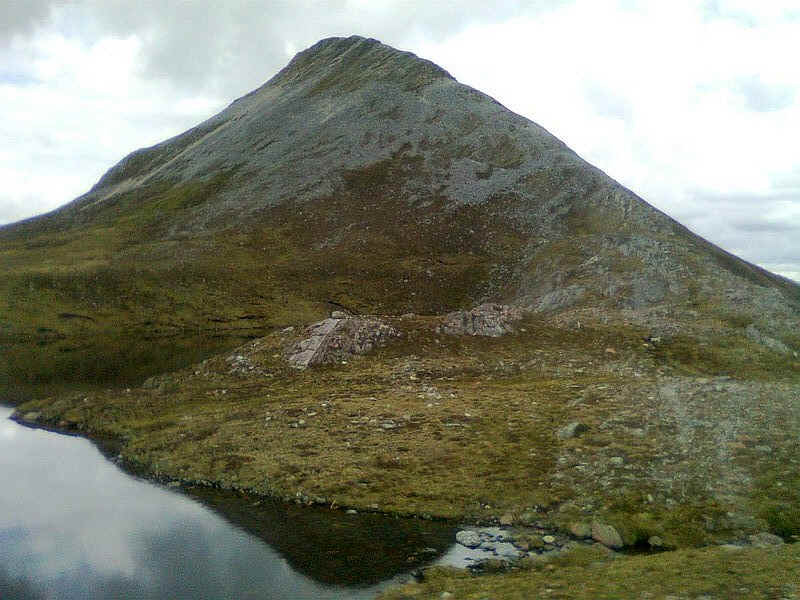 Once down at Coire an Lochan I had a break and did some time calculations to see if I had time to go on to Binnein Beag and still arrive back at Kinlochleven in time for the bus back to Fort William for dinner at my hotel. 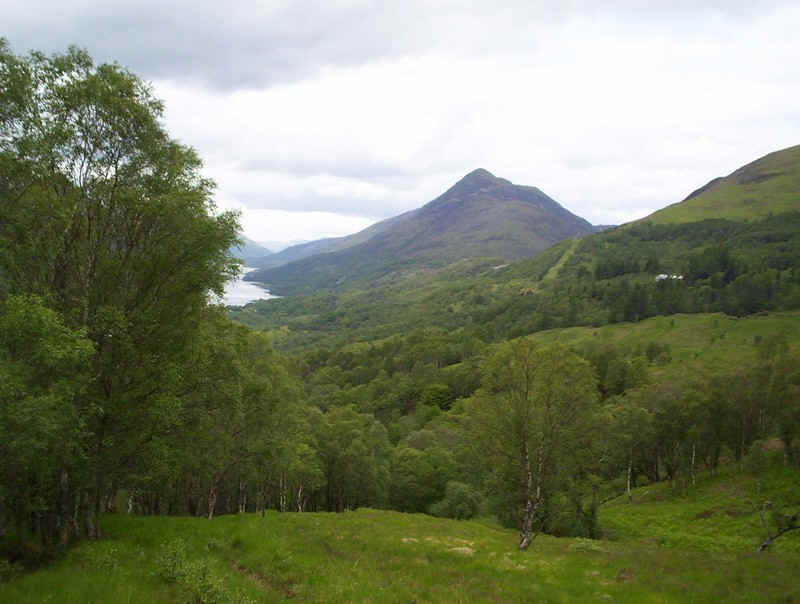 It seemed just about possible but there was always Plan B; fish and chips in Kinlochleven and a later bus. 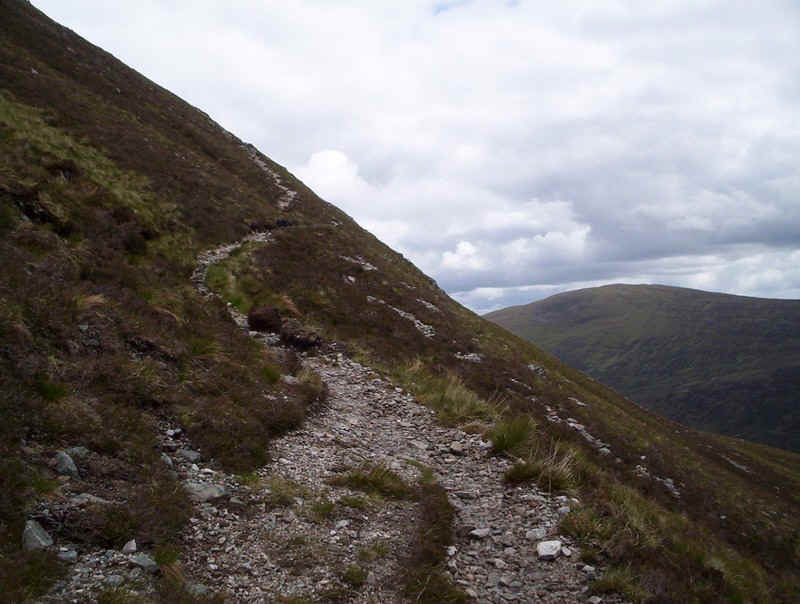 The photograph above shows the whole of the next stage of the walk along a superb path to the col just below Binnein Beag and then up the ridge to the summit. 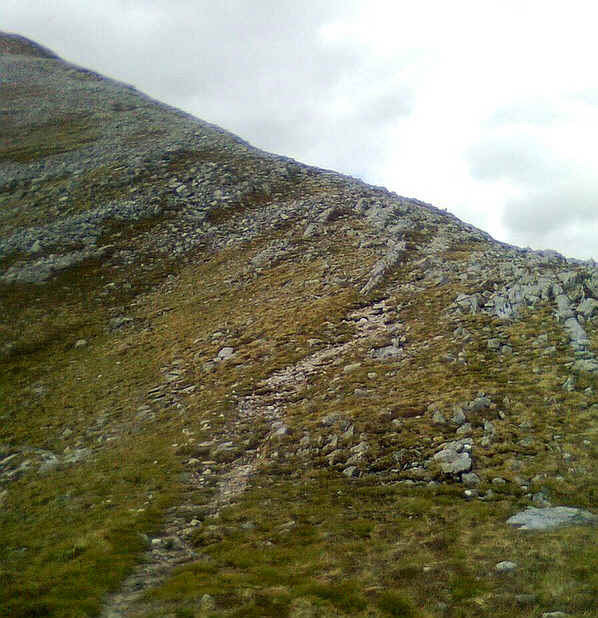 ....and starting the climb up the eastern flanks of Binnein Mor. 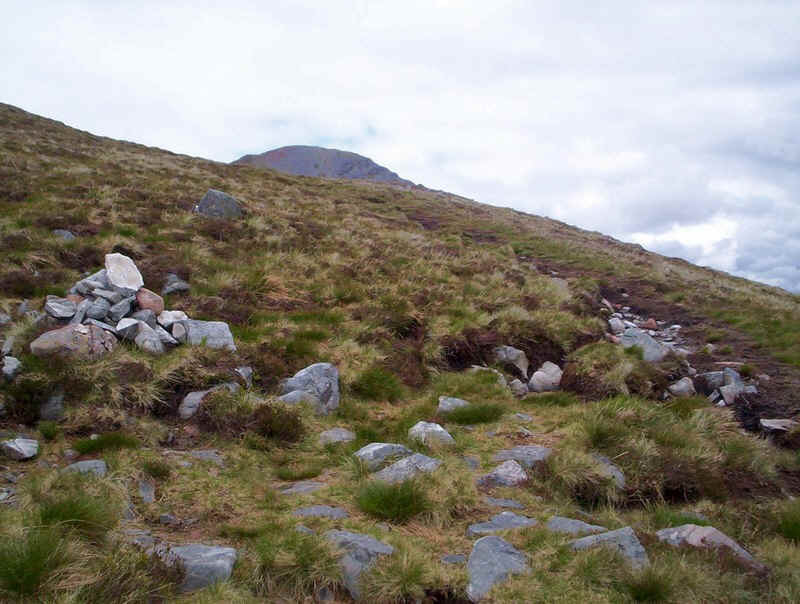 It was here that I had a rather unnerving experience when a boulder about a foot across bounced sown the hillside and across the path about a hundred feet in front of me. Quite what had caused this I don't know but it was a reminder of how danger sometimes comes from unexpected sources. 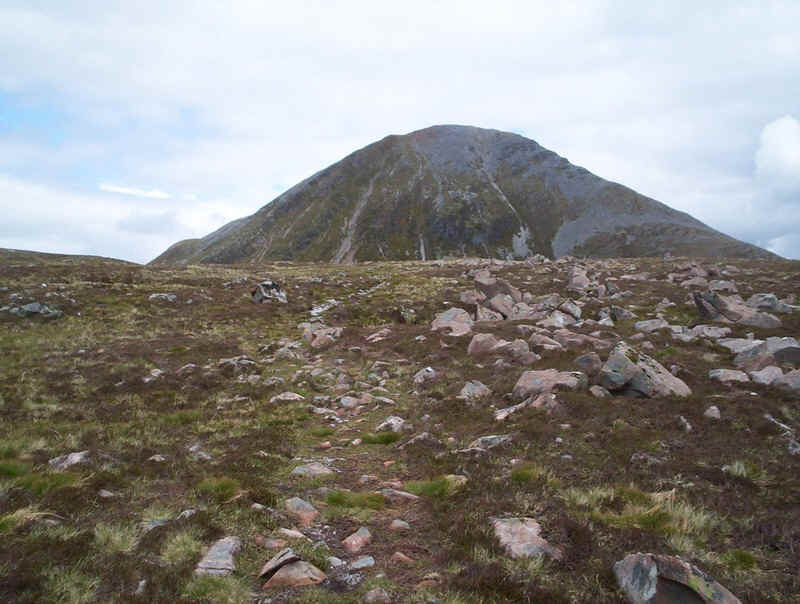 ....and is climbed up its southern ridge. 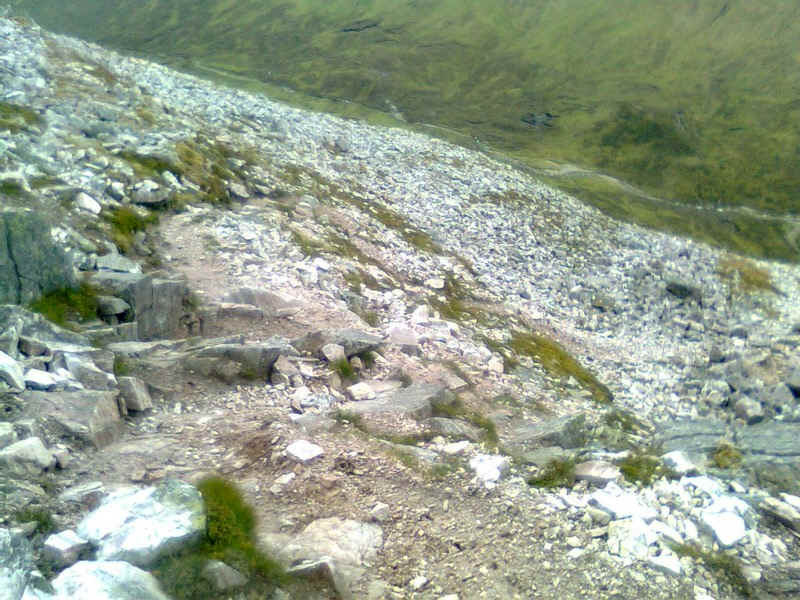 The path is clear although it sometimes disappears among the boulders. 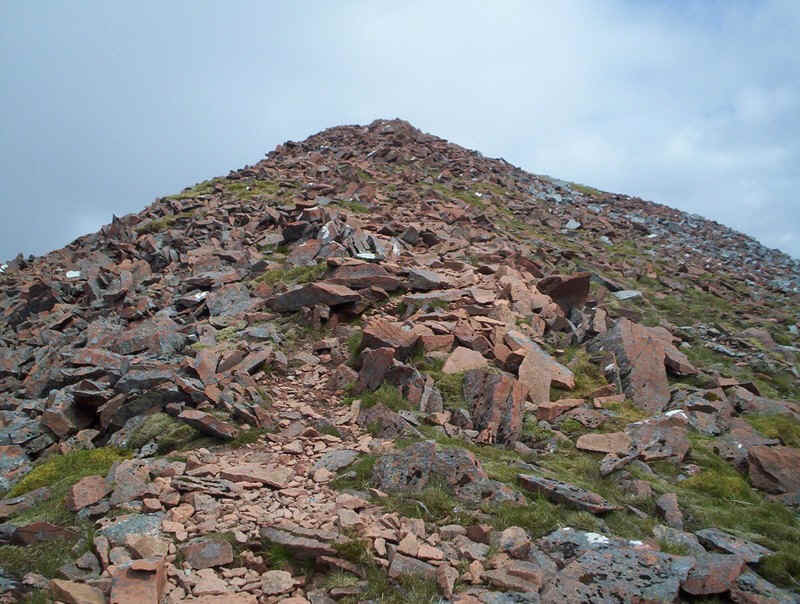 Higher up there are one or two rather scrambly sections. 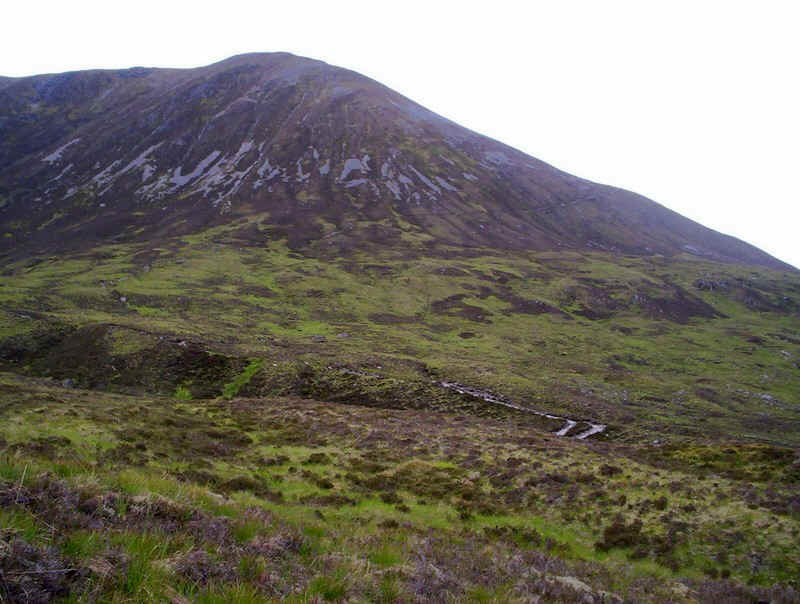 Looking downhill to the lochain with Binnein Beag towering above. 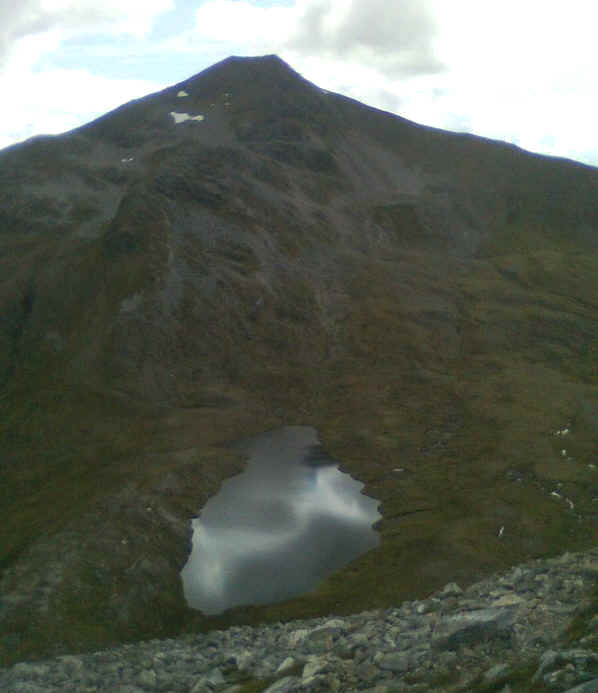 Once again, I was pleased with my progress, the walk form Sgurr Elide Mor had taken exactly two hours as I'd expected. 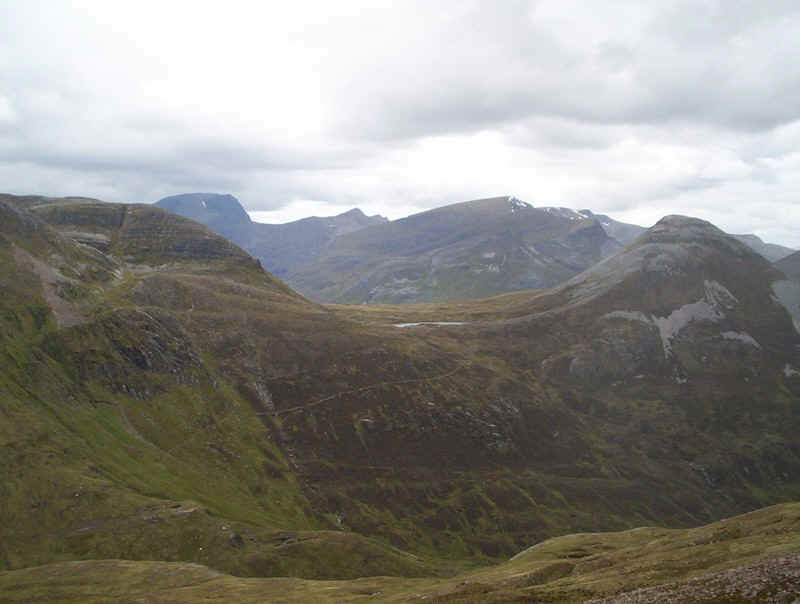 ......and a panorama across the upper reaches of Glen Nevis. 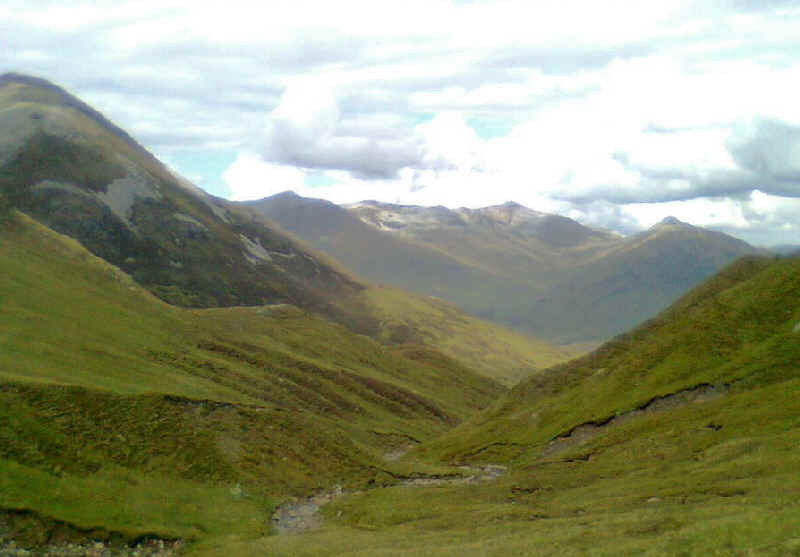 Looking across to the Grey Corries. 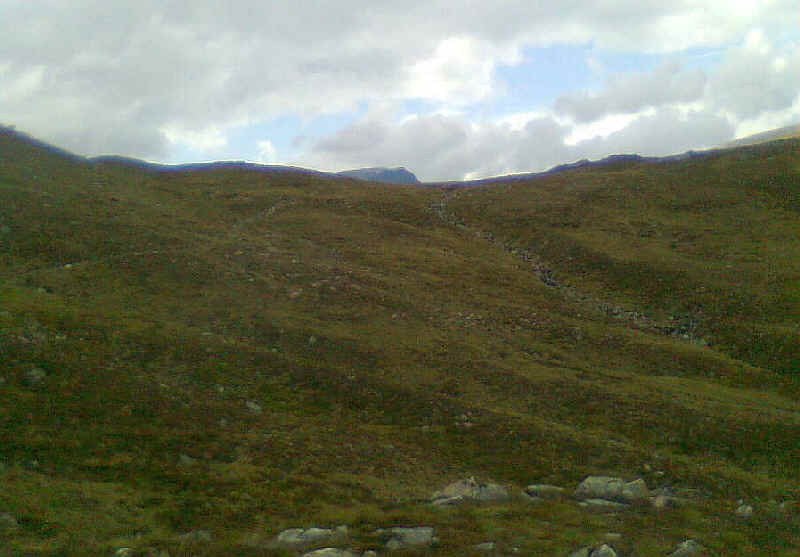 ....before a climb back up to the stalker's path above Coire an Lochain. 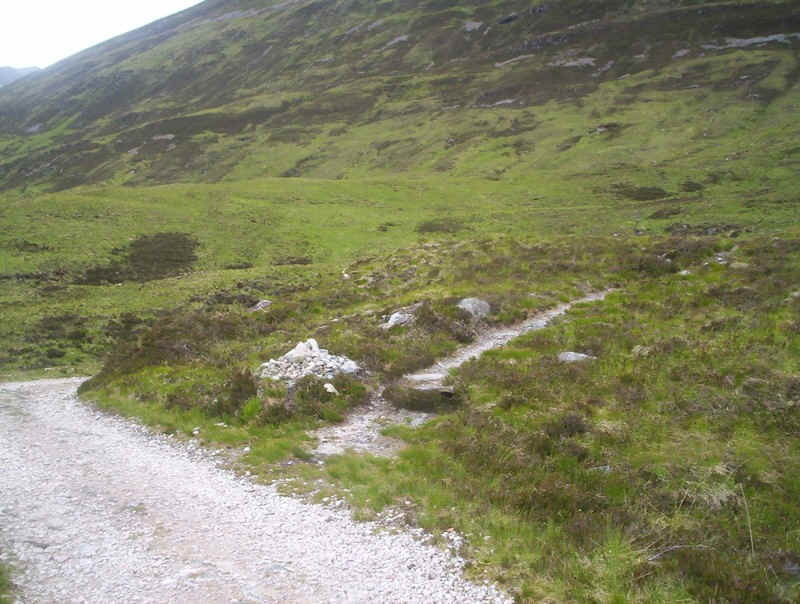 This isn't something you want towards the end of a day's walk. 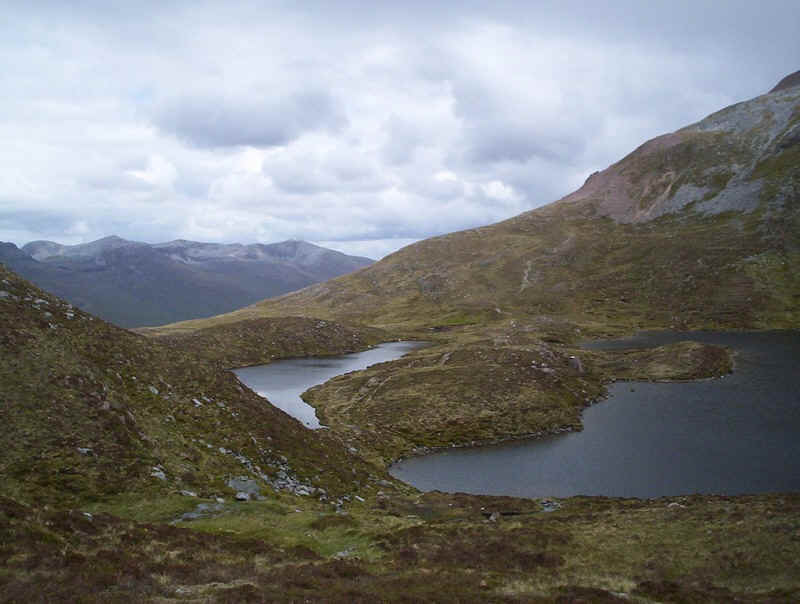 Coire an Lochain in the early evening light seen from the path higher above the water. 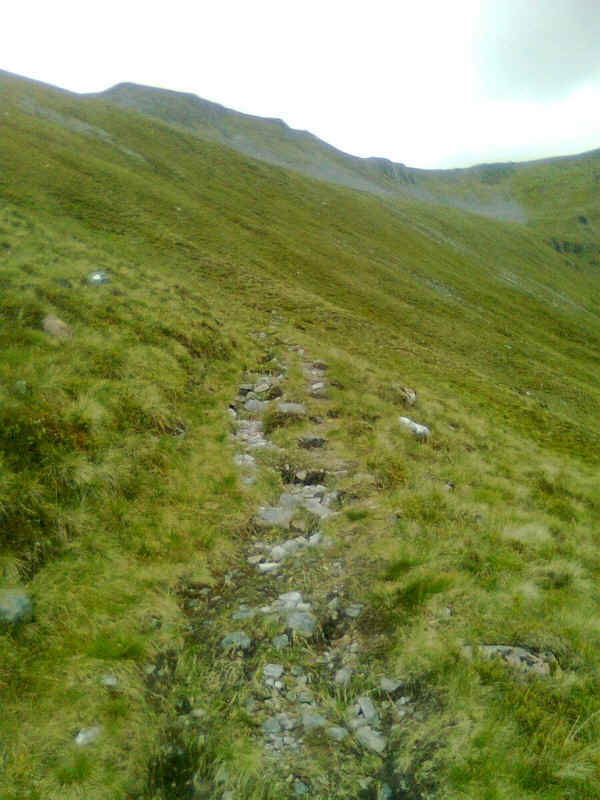 ....in a series of zig zags to reach the path I'd come up in the morning. 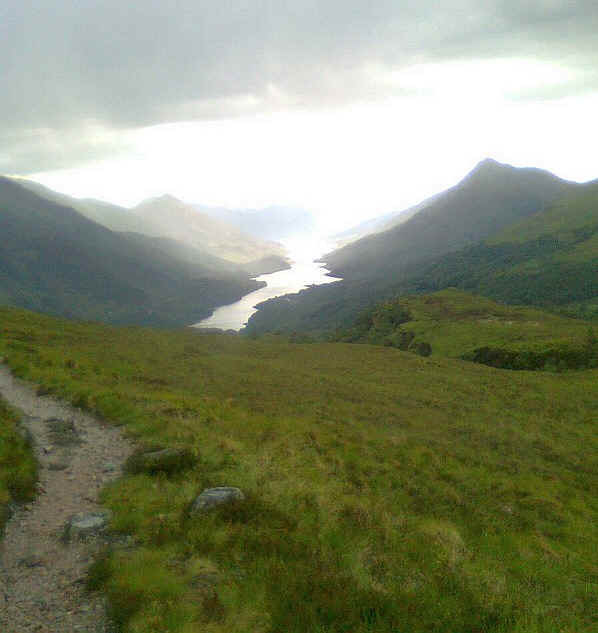 A final view of the evening sun over Loch Leven. 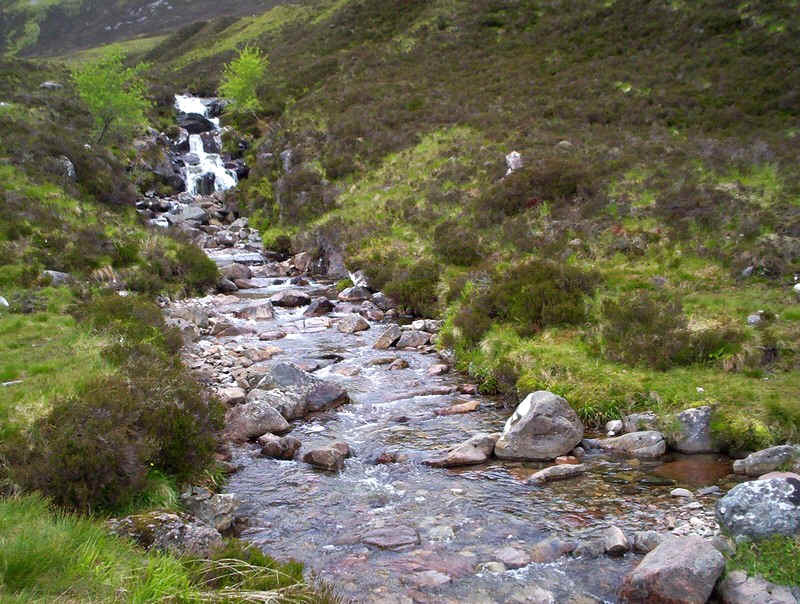 I arrived back in Kinlochleven at 8.25 p.m.having taken just three and a half hours from Binnein Beag too late for the earlier bus but with plenty of time to enjoy the superb fish and chips from the 'chippie' near the Tailrace Inn. 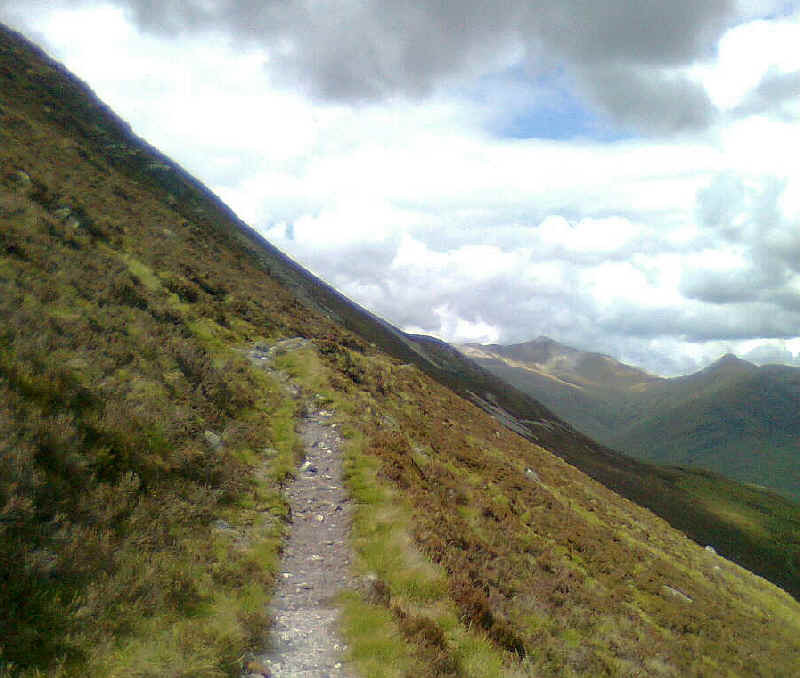 It was a superb walk and a good end to my June 2011 Munro bagging holiday, The total now stands 105.